"Ten Cylinder Rotary Type-Revolving Press." Robert Hoe, A Short History of the Printing Press, 1902, p. 35. Collection of The Skyscraper Museum and The Times Annex, 1913. Courtesy of The New York Times Company. Papier-m�ch� molds, also known as mats or flongs, were produced in newspaper composing rooms. Once the composers had laid out a page using a linotype machine, they pounded layers of paper and glue into the metal type to create a mold. The pliable flong was then transferred to the stereotyping department, where workers steam-pressed it onto a curved cylinder and injected molten lead against it to form a curved lead plate. Once cooled and trimmed, this stereoplate was attached to a press cylinder. A duplicate flong could be stored for later use, requiring far less space than a tray of type or a curved metal plate. 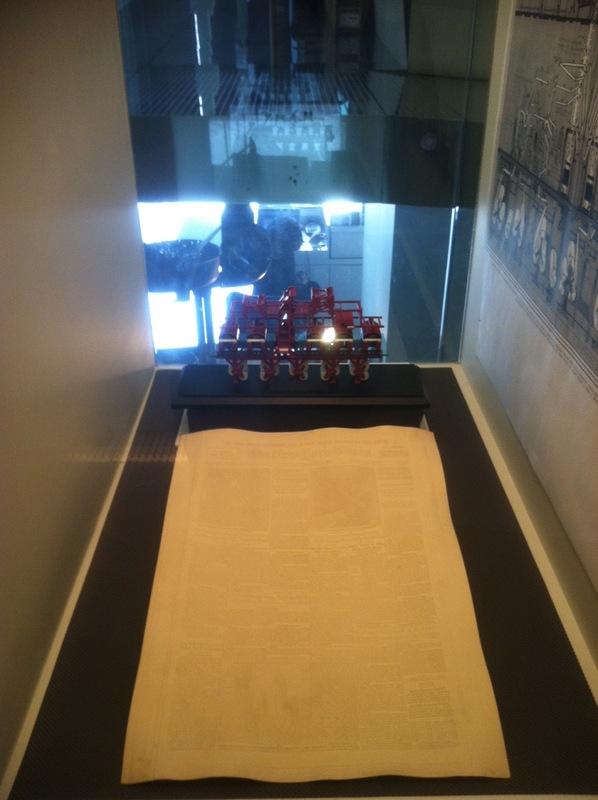 The paper mat on display here is on loan from New York Times reporter David Dunlap, to whom it was given as a souvenir of his first bylined front-page photograph. The July 2, 1978 edition that this mat helped produce was the last at the Times to use linotypes, mats, and lead cylinders. A new cold-type process using computers and thin plastic plates was introduced the next day. This model, on loan from Allan M. Siegal, represents a five-unit double-wide press in use until 1997, the year the Times ceased printing at 229 West 43rd Street. 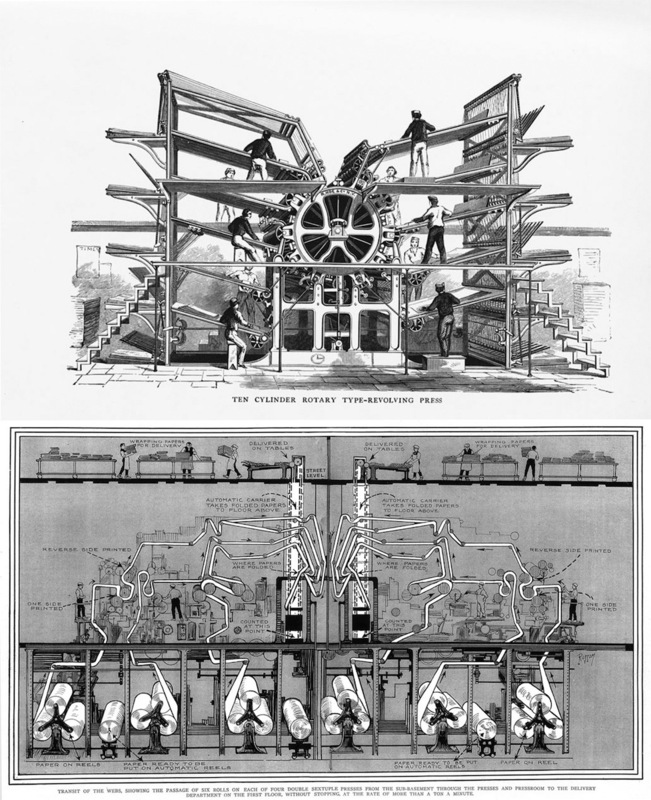 The graphics at right represent two eras in printing: an R. Hoe press shows the mid-19th century process of feeding individual sheets manually, while the diagram of the presses in the Times Annex shows the paper path used by advanced web-fed presses in the early 20th century.